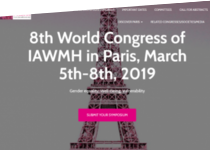 The International Association for Women’s Mental Health (IAWMH) in collaboration with La Société Marcé Francophone (SMF) are very pleased to invite you to the 8th IAWMH World Congress on Women’s Mental Health, which will be held in the Cité Internationale Universitaire in Paris March 2019 (5-8th). Clinicians and researchers involved in the field of women’s mental health from every country are invited to attend this congress and to contribute. This invitation, however, does not entail any financial commitment from the IAWMH 2019 (registration, accommodation, travel and any other expenses) and it does not guarantee the issuance of a visa to enter France. The IAWMH 2019 secretariat makes no contact with embassies or consulates on behalf of the foreign participants invited to the event. The main domains of interest at the congress will be: Gender equality, Well-Being and Vulnerability which are important contributors to Women’s Mental Health. There will be outstanding Plenary Lectures, Scientific symposia, Educational and Special lectures, Workshops, Free Communications and Poster sessions, and also many social events to help you discovering the wonderful cultural city of Paris with guided tours. We will dedicate all our efforts making this Congress an unforgettable experience for you and we are looking forward to welcoming you in Paris in March 2019, around the Women’s day.